The Blues recalled Magnus Paajarvi from the AHL Chicago Wolves on Saturday night. 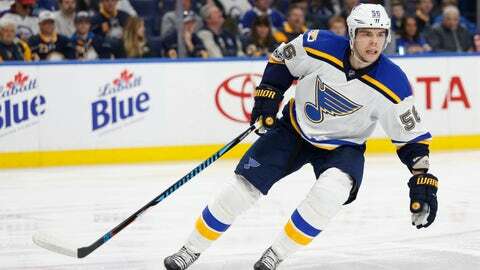 ST. LOUIS — With their five-day bye week now finished, the St. Louis Blues recalled forward Magnus Paajarvi from the AHL Chicago Wolves on Saturday evening. Paajarvi has played in the Blues’ last seven games, but he was sent down on Tuesday so he could remain active during the break. Paajarvi, 25, has dressed in 26 games for the Wolves this season, tallying 18 points (seven goals, 11 assists) and two penalty minutes. The 6-foot-2, 202-pound forward has also appeared in 10 games with the Blues, recording four points (three goals, one assist) and two penalty minutes. Overall, the Norrkoping, Sweden, native has played in 286 NHL games, accumulating 84 points (38 goals, 46 assists) and 56 penalty minutes. Paajarvi likely would have been joined by Ivan Barbashev, who was also sent down on Tuesday, but Barbashev suffered an injury while playing for the Wolves on Wednesday. He’ll now remain in the AHL while he recovers, with Dmitrij Jaskin or Nail Yakupov replacing him in the Blues’ lineup when they face the Chicago Blackhawks on Sunday.